Lets aroma your place with this floral design durry. It contains a different type of flowers in the cream color ground. It has very intricate design pattern and really very difficult to make it. This beautiful woolen durry is absolutely ideal for living room. 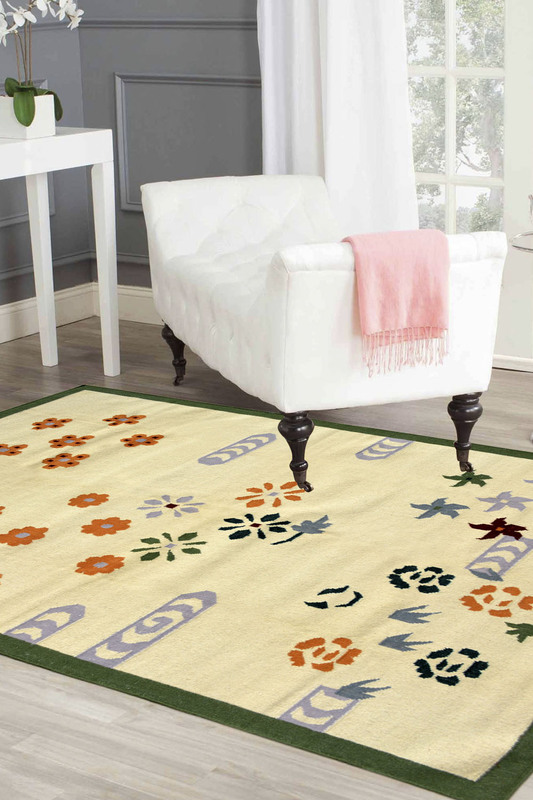 - This rug replicates the look woolen handwoven dhurrie rug. - This dhurrie is 100% dust free dhurrie. For the color fixing, we use wet dying process. - first, we dying natural cotton yarn and after that weave on a loom. - It is designed to be hard wearing, durable and affordable. - It has 100% fast color and also reversible. It means you can use it both side. This design is a "One of a kind design. - It has a beautiful ground in yellowish color and green border with bold flower motifs and as well as in the ground. - It has taken approximately 30 days to create this beauty.